“A probing examination of the relationship between medical science and the human spirit. 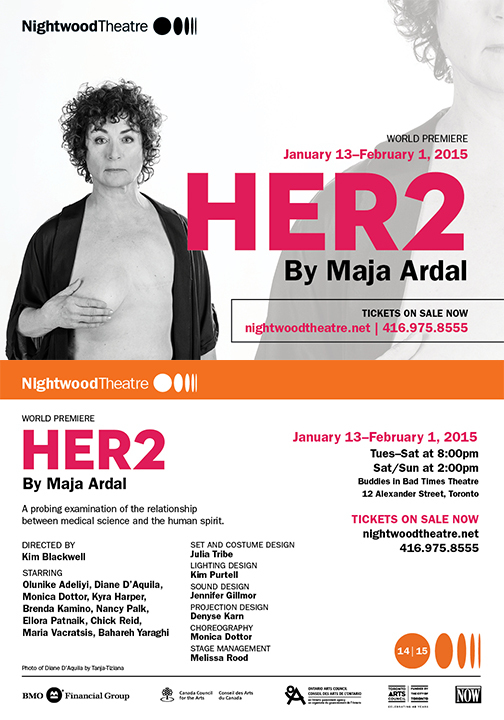 (Toronto)—Nightwood Theatre continues its 2014/15 season with the world premiere of HER2 by celebrated playwright Maja Ardal at Buddies in Bad Times Theatre, 12 Alexander Street, from January 13 to February 1, 2015. 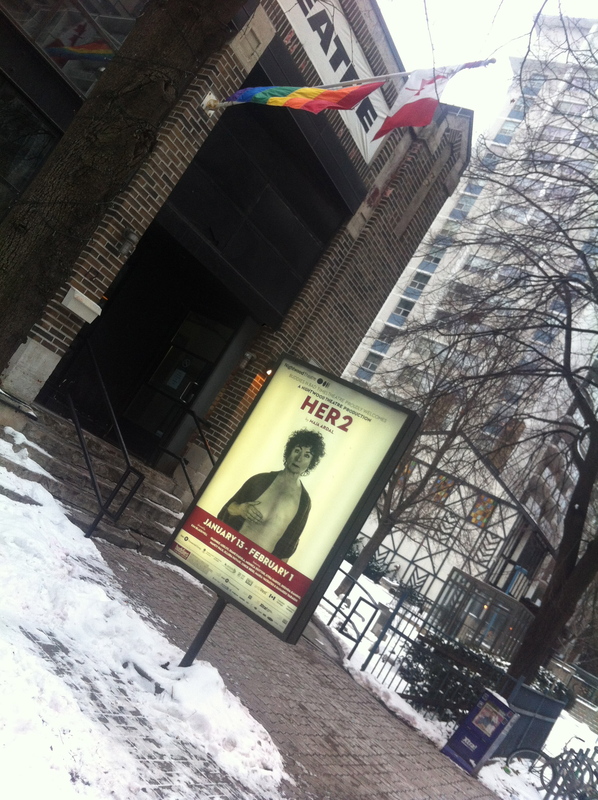 Directed by Kim Blackwell and featuring a stellar all-­‐female cast, HER2 is a probing examination of the uneasy relationship between medical science and the human spirit. I never thought I would be diagnosed with breast cancer. Breast Cancer affects 1 in 8 women in their lifetime. Breast cancer is glamorized into a disease that is pre-packaged and pretty in pink. This does not reflect the physical suffering of woman and the psychological impact on the family. This series communicates my challenges with breast cancer self-image and what it means to be a woman when choosing a mastectomy rather than a lumpectomy. Inspired by Christian triptyk altar pieces, I have brought my story of suffering and triumph to be shared as a point of dialogue for challenges faced by women with breast cancer and to create change. I was prescribed Tamoxifen for hormone positive breast cancer based on recent research for a 10 year treatment cycle. There is no regulation to test whether women can metabolize Tamoxifen to be effective. 20% of women are unable to metabolize Tamoxifen and will die. This is a call to action to have women on Tamoxifen tested for metabolization before they are prescribed medication to save their life. This is my story seen through my eyes, my husbands eyes and my daughter eyes over 2026 days. 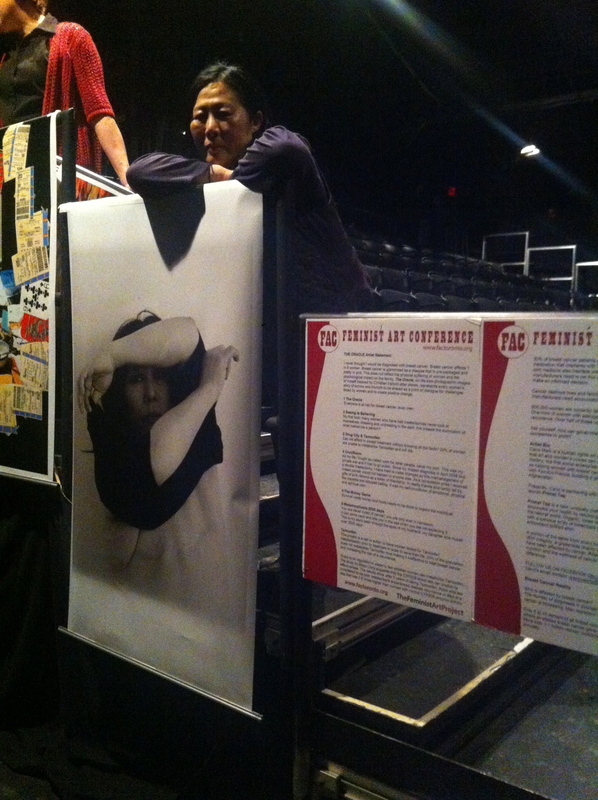 Carol Mark with her exhibition installation at Buddies and Bad Times Theatre.